Hong Kong is considered as one of the most significant places in the global economic system. 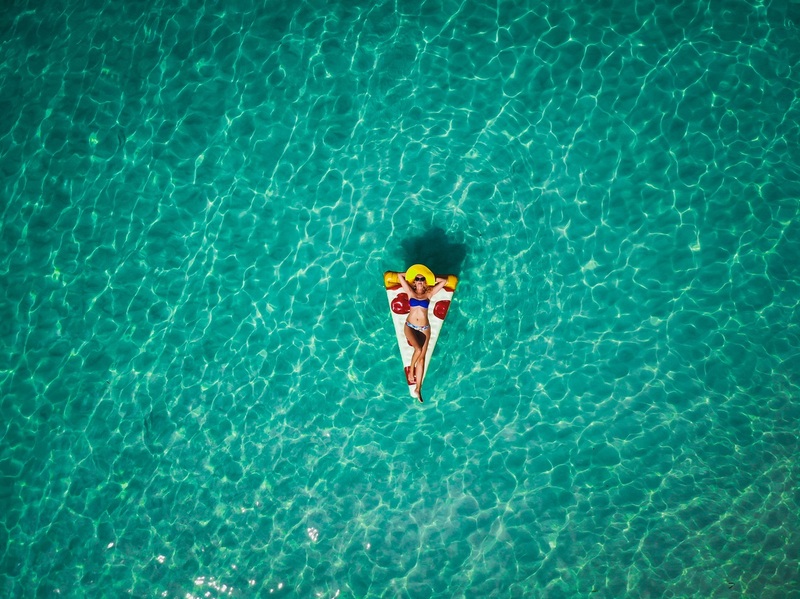 It is an enormously globalized city as well as one of the most famous tourist destinations, which is growing bigger and wealthier with each passing day. But one should not be fooled by the outer glitter and glam of this city. There is another side, hidden so subtly behind the luxurious aura that one fails to see the other side of it. In a developing city, there is always a side that develops while one that suffers. Such too is in the case of Hong Kong. Even though previously, Hong Kong has topped the list of being one of the world’s most livable cities, there are a lot of untold secrets about it too. To reveal the real picture of the city, a Hong Kong based organization, Society for Community Organization (SoCO), did a project showcasing the lives and conditions of people living in severe conditions. 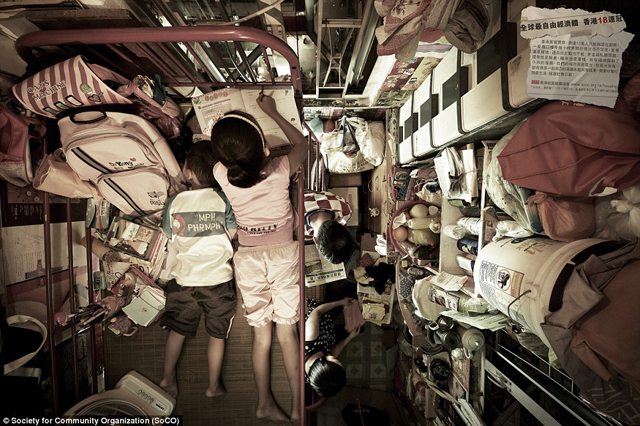 A large percentage of Hong Kong’s population lives in conditions that are beyond imagination. The revelation of living at Vertical Homes. According to SoCO’s research, more than 1,00,000 people are living in tiny cubical apartments which are known as the ‘slum apartments’. These apartments are approximately 40 square feet in area and are created by dividing existing apartments into multiple units. Another interesting fact about Hong Kong is the land-man ratio of this city. It has a landmass of 1,104 square km and a population of seven million, making it one of the most densely populated areas in the world. Due to which the land and housing rates are exuberantly high and there is a long waiting list to get proper accommodation. This is the reason why many people are unfortunately living in these slum homes and managing under the hard conditions. 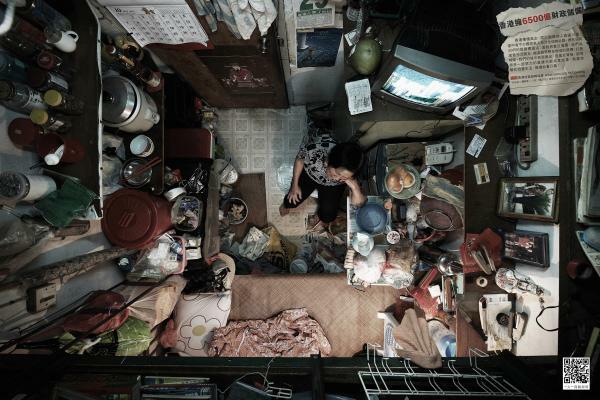 To bring awareness around the world and show the real picture of Hong Kong, SoCO has released a set of images that show the condition of people living in these ‘Slum homes’. A major percentage of them are elderly people, low-income families, and bachelors, who can’t afford to pay high rents and housing prices of the city. The hidden side of living at Vertical Homes. In such images, one can easily see the limited space access provided to the people and the difficulties faced by them while staying in these structures. They have to adjust and manage everything in a single room starting from their beddings to wardrobes as well as kitchen equipment. To make the stay bearable, people have started using the walls to adjust and hang necessary items, sometimes even the beds for children are suspended on these walls. The government, unfortunately, has been ignoring the growing rich-poor gap, which has been increasing since the 70s. In 2007, a Hong Kong government census showed that the number of families earning less than HK$4,000 a month has increased by 80,000 whereas those earning more than HK$40,000 has increased by 1,00,000. This clearly shows the drastic increase in the rich-poor divide. It is the moral responsibility of the Hong Kong government to improve the living conditions of its citizens. It is not only a painful and difficult place to live in but with the surroundings, the area is disease prone which can be hazardous to the people of the society.